William Marson Bennett was born on 5 Aug 1891 in Mersey, Devonport and died in 1965 in Heidelberg, Victoria at age 74. William married Myrtle Henrietta Brimfield, daughter of Thomas Edwin Brimfield and Martha Henrietta Helena Rice, on 1 Jan 1919 in Home of the brides parents, Kangaroo Valley, New Town, Tasmania. 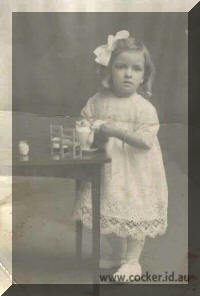 Myrtle was born on 7 Mar 1895 in Hobart, Tasmania and died in Victoria. They had two children: Joan Frances and Elaine. 4-Joan Frances Bennett. Joan married James Arthur Brown.